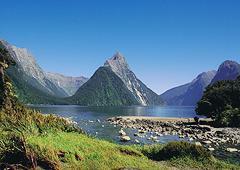 Fiordland was well known to the Maori and many legends pertain to its formation and naming. Demi-god Tuterakiwhanoa is said to have carved the rugged landscape from formless rock. Few Maori were permanent residents of the region but seasonal food-gathering camps were linked by well worn trails. Takiwai, a translucent greenstone, was sought from Anita Bay and elsewhere near the mouth of Milford Sound. Captain Cook and his crew were the first European to visit Fiordland and in 1773 spent five weeks in Dusky Sound. Cook's maps and descriptions soon attracted sealers and whalers who formed the first European settlements of New Zealand. From the middle of the 19th Century surveyors, explorers and prospectors began to penetrate the unexplored interior of Fiordland. The hub for sightseeing activities in the region is based in the progressive and attractive resort of Te Anau, nestled on the tranquil shores of Lake Te Anau. Te Anau has over 3000 beds available through the whole accommodation range. The road to Milford Sound is one of the world's finest alpine drives. From Te Anau the road winds down the Eglinton and Hollyford Valleys then through the Homer Tunnel and to the awesome sight of Mitre Peak towering above the glassy waters of Milford Sound. From Te Anau to Milford Sound takes two hours without stops so please allow sufficient time for scenery and photo opportunites. Boat trips on the Sound are a must and allow sightings of dolphins and seals and provide close up views of the awesome scenery. There is also an underwater observatory is nestled in Harrison Cove (which is easily accessible by water taxi), guided diving and kayaking. Divers are able to view Red and Black corals living in less than 20 metres. It is the getaway to the scenic wonders of Doubtful and Dusky Sounds and the starting point for many walking tracks, hunting and fishing trips. Doubtful Sound is the deepest of all fiords. A haven with its ancient rain forest and abundant wildlife it is quite simply and unquestionably breathtaking. Practically untouched by man the physical grandeur of towering peaks, outstanding waterfalls (Browne Falls cascade 619 metres to the fiord near Hall Arm) and lack of wind create a powerful atmosphere of solitude and serenity. 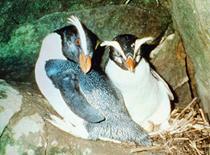 See Fiordland crested penguins, bottlenose dolphins and New Zealand fur seals. Te Anau is internationally renowned as the "Sightseeing Walking Capital of the World" as it is located close to the main southern walking tracks. These tracks offer a sense of freedom, an escape seldom found in any other areas of the world. Walking allows access to towering snow capped peaks, tussock clad alpine plateau, rain forest and the dramatic beauty of this southern paradise. All walking tracks are accessible for independent walkers, guided options are available on the Milford, Hollyford, Routeburn and Greenstone Tracks, Kepler, being a circular track, starts and finishes in Te Anau and is the newest track in Fiordland. Fiordland is a dramatic and beautiful part of New Zealand. It is an important stop on a fly/drive itinerary and has the range of activities for any short break, whilst offering the speciality of walking. Visit Fiordland and sample some of the activities and food from venison to seafood and in particular Lobster. A truly magnificent area of New Zealand. Coach services bring passengers in from the West Coast of the South Island, Christchurch, Dunedin and Invercargill. Fiordland is also the commencement/finish point of the Southern Scenic Route, a spectacular travelling route through the south of the South Island, linking rural towns and the cities of Invercargill and Dunedin on the East Coast. Local Walks - Manapouri - A 20 minute drive from Te Anau, this area offers either a short loop track with spectacular views of Lake Manapouri and the Hunter Mountains or one/two night trips in lowland forest on well marked tracks. Hollyford Track - An 80 km long valley leads the walker from the sheer rock walls of the Darren Mountains down to the sand dunes of the Tasman Sea at Martins Bay. Experience the relative isolation of the Fiordland bush, the bustling energy of the Hollyford River and the sand and windswept beauty of Martins Bay. Routeburn Track - A 39 km walk starting from the Divide between eastern and western sides of the Southern Alps and ending in the beech forests some 80 km by road from Queenstown. Dramatic alpine views, lakes and changing forest types can be experienced over the summer season on this three/four day walk. Milford Track - Described as the finest walk in the world this 53.9 km walk follows several glaciated valleys, ascends an alpine pass and traverses some of the finest scenery in the world. The walk takes four days and involves boat travel at both ends. Kepler Track - A 67 km walk starting and finishing at Lake Te Anau. Lake edges, mountain beech forest, exposed mountain tops and glacial valleys along with excellent views of the Southern Alps may be obtained on this three/four day trip. Dusky Track - The track with a difference; this 90 km walk is both isolated and suitable for those with experience seeking a challenge. Various options allow the traveller to spend five/seven days following three major river valleys. Climbing two passes culminating in the arrival at Fiordland's largest and most extensive fiord - Dusky Sound. Lakes Hauroko and Monowai - Two large lakes accessible by road or boat with camping and hut facilities available. Hauroko, the deepest known lake in New Zealand, and Monowai offers opportunities for walking, boating, scenic viewing, fishing and bird watching. Fresh Water Fishing - With the use of a guide, wilderness fishing the wilds of Fiordland National Park can be very rewarding. The lakes and rivers of Fiordland offer excellent fishing for brown and rainbow trout. Licences must be obtained and their regulations adhered to. Although most rivers are easily accessible by the family car there are still adventure areas which are only accessible by four wheeled drive vehicles, jet boats or helicopters. In addition to this there are wilderness reserves for foot access only. Local guides can alleviate your transport problems or concerns. There are many guides in Te Anau who are members of the New Zealand Professional Fishing Guides Association. Hunting - In the early 1900's red deer, wapiti, possums and even moose were liberated around Fiordland. Although no moose are thought to have survived, the wapiti bugle draws hunters from around the world each autumn. Permits to hunt red deer, wapiti and possums can be obtained from the Fiordland National Park Visitor Centre. 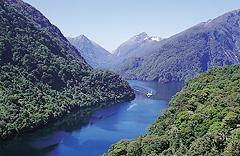 Wildlife - Fiordland is home to several threatened native animals. The Murchison and Stuart Mountains support about 160 takahe, a flightless, alpine bird thought extinct earlier this century. The birds are carefully monitored in a restricted area of the park and their numbers boosted by an artificial rearing programme. The Eglinton Valley is a stronghold for yellow-crested parakeets, yellowheads, (mohua) and long-tailed bats. South Island saddlebacks, absent from Fiordland for nearly a century, have been reintroduced on Breaksea Island. The rare Fiordland skink, Bown, Teal, Blue ducks and southern Crested Grebes are found on Fiordland lakes and streams. Visitors are likely to see the common forest birds like tomtits, brown creepers, grey warblers, fantails, tui, bellbirds and wood pigeons. The cheeky mountain parrot, the kea, is a regular entertainer at higher altitudes. Marine Life - The marine environment of Fiordland is an unique as its land areas. Heavy rainfall created a permanent freshwater layer above the sea water within the fiords. Stained by tannins washed out of the vegetation, this layer cuts down the amount of light and restricts almost all of the marine life to the top 40 metres of water depth. This 40 metre band is calm, very clear and relatively warm - home to sponges, corals and fish of subtropical, cool water and deep water varieties. The fiords support the world's biggest population of black coral trees - about seven million colonies, some of them up to 200 years old. They are home also to brachiopods: primitive clam-like animals which have been bypassed by evolution, remaining unchanged in over 300 million years. Bottlenose dolphins, fur seals, Fiordland crested penguins and little penguins are also resident in the fiords.